5 STAR REVIEWS! SAVINGS BEACH FRONT! Spacious Corner Unit! SEE THE VIRTUAL TOUR AND U-TUBE VIDEO BELOW BETWEEN THE MANAGER INFO AND PHOTOS. Kanai A Nalu has been rated The Best Vacation Property in Ma'alaea. Spectacular ocean vistas are guaranteed in this specially designed condominium building. This CORNER UNIT #417 faces the ocean and has a lanai featuring uninterrupted views of Ma'alaea Bay, Kihei, Wailea, Makena, Upcountry and Haleakala. Spectacular whale watching from the lanai during whale season. Plus, you can watch the sun come up over Haleakala (Maui's dormant volcano, which rises 10,000 feet above sea level. The complex is CENTRALLY LOCATED on Maui. It's approximately 1/2 mile from the Aquarium, the harbor, grocery store, restaurants and shops. Our condo is on a dead-end street so there is very little traffic and it is very QUIET. There is absolutely no traffic noise from the main road in our unit. You can enjoy deep relaxation inside or on the lanai, at the sandy beach or at the beautifully manicured lawn with tropical landscaping downstairs. When you first enter, you will be greeted with the magnificent view of the ocean beyond the living room. Not many condos are available this close to a sandy beach, where you can swim or snorkel....RIGHT IN FRONT of the building (weather and ocean conditions permitting). In the morning, you can take a walk along the quiet sandy beach (miles long toward Kihei). This is possibly the most uncrowded beach on Maui. There is also a government protected Wildlife area near the beach for endangered sea turtles, so no development is allowed here. This is for sure one of Maui's finest beaches! *Kanai A Nalu #417 has a new California King Tempurpedic bed in the Master bedroom and now has a King bed in the second bedroom also. Condo sleeps 4 maximum. *One 42 inch flat screen TV in living room and one 32 inch flat screen TV in master bedroom. *Approx. 2 minute drive or 10 minute WALK distance to the NEW MAUI OCEAN CENTER. *Maui Ocean Center's first class AQUARIUM with a clear under water tunnel is top rated the best attraction for FAMILY. *Neighborhood is adjacent to Ocean center,there several fine dining and family RESTAURANTS to choose from. The harbor features restaurants, Hula Girl's Cookies & Ice Cream, and the Pacific Whale Foundation. The Ma'alaea Harbor boats run daily on snorkeling and sunset cruises, winter Whale Watching trips. *2 large elevators in the building. Whether you want to get away from it all for a little R&R, or you want to experience everything there is to offer on Maui, Staying at Ma'alaea Village is the solution! You will fall in love with this terrific Top Floor condo. This corner condo unit is located on the top floor of Kanai a Nalu which is considered by many to be the best condo building in Ma'alaea Bay. There are breathtaking views and the sound of the waves to help lull you to sleep. This condo is very quiet and very private place. What more can you ask for? 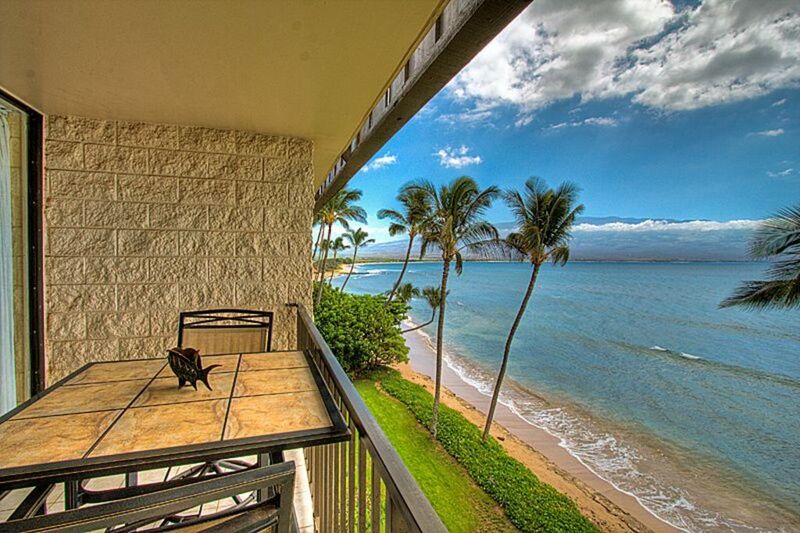 Enjoy breakfast on your lanai and if you keep your eyes on the sea, you can do some whale watching at the same time. Go for a swim in the deep blue ocean that is only a few steps away, or stretch out by the pool. Do you like to take a stroll along the beach? Well, you can do that too, it goes on for miles in complete serenity. Of course we have cable TV and high speed Internet access. Check in is after 3PM, Check out is at 11.00 AM. Early Check in or Late Check out must be requested at time of booking for an additional nightly fee. 5 miles of uncrowded beach, whale watching in Maalaea Bay which is the Humpback Whale calving and breeding grounds during the winter months (November through April) right in front of the property! Ocean swimming, boogie boarding and surfing (during south swells), and windsurfing! The Pacific Whale foundation is a 10 minute walk from the property so you can walk to your whale watch tour, or take educational classes without a car! Their is a charming local store called 'Tradewinds' 5 minutes by foot, for local meat, fruits and vegetables, liquor. Their fruit cup is a must! Building is within 40 feet from ocean. Telephone for local (island of Maui) calls only. Wheelchair access throughout the property but may be limited within the unit. The condo was beautiful and very clean. A very comfortable place to stay for myself, my mom and my mother-in-law. The view was gorgeous. The owners had thoughtfully left everything we would need, including washer pellets, trash bags, toilet paper etc. The kitchen was fully stocked, though olive oil would have been helpful. We couldn't figure out how to get the ice maker to work, and they came out immediately to inspect it (turns out we just needed to flip a switch inside). The showers were great. The bathtub was nice, but not enough hot water to fill the tub unless you took a break in filling it. The pool was lovely and the grill area wonderful. The beach in front is not for lying out (you can place chairs on it) but if you walk several yards to the left you get beaches you can lay out on. You just can't bring the lawn chairs. Overall, it was a quiet and lovely spot. If you want to be closer to action, I recommend Lanaiha (about a 25-30 minute drive up the coast). However, being near the Maalaea harbor was great for whale watching cruises and Beach Bums had wonderful food! It was our first time to Maui and this rental did not disappoint. The private beach is right below the condo, with miles of beach to walk without the crazy resort feel. Pure relaxation. Whales are swimming in the bay, turtles swimming right in front of the lanai overlooking the ocean. Snorkeling in the reefs out front of the condo. 20 minutes to eating and shopping in either direction. The bay has some restaurants but need to go further out for some variety. Don't forget the malasadas at the local bakery's. Condo a bit dated but great views and very comfortable. Great place to stay. Central location and a quiet beach that isn't crowded with people. Great place to stay. Clean, Quiet and central to all of the popular spots on Maui. View from the Lanai was spectacular can see whales and turtles. The only people using the beach are the tenants of the condo so it is not crowded at all. I would recommend staying at this this condo. perfect in every way. would stay again. condo was in great location and very comfortable. loved hearing the waves at night. Loved the corner fourth floor location, views, cleanliness, attentiveness of property management. Incredibly well stocked kitchen. A great experience. Conveniently within walking distance to restaurants from casual to fine dining, Maui Aquarium, public transportation and family sports center that features; (mini golf, water bumper boats, extreme trampoline and rock climbing) gas, shopping and the harbor! Maalaea is the most central location to all points of interest saving lots of drive time. We are always available and hands on helping our guests plan all of their Maui fun so that they have the best Maui experience possible!